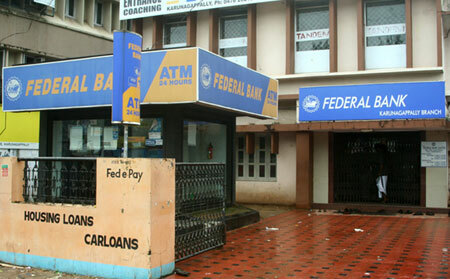 Federal Bank Limited is a major Indian commercial bank in the private sector, headquartered at Aluva, Kochi, Kerala. As of March 31 2011 it has 743 branches spread across 24 states in India and 803 ATMs around the country (across 108 metro centres, 224 urban centres, 384 semi-urban locations and 87 rural areas ). In the year 1931, Travancore Federal Bank was inaugurated at Vengal Varuttisseril at Nedumpuram, near Tiruvalla, Kerala. The 14 founders included Sri Vengal Varuttisseril Oommen Varghese, his brothers Oommen Chacko, Oommen Kurian, Oommen George and also another person from Tiiruvalla, Kavumbhagam Mundapallil Lukose, and others. Oommen Varghese was the Chairman and Oommen Chacko the Manager. After it had functioned for nearly 10 years, the bank’s day to day transaction had to be stopped due to the ill-health of the Manager. Understanding this situation, a lawyer from Perumbavoor named Sri K.P.Hormis and his acquaintances joined together, bought the bank and took over the management. In 1945, they moved the bank’s registered office to Aluva and Hormis became the Managing Director. In 1947,the bank’s name was shortened from Travancore Federal Bank to Federal Bank. In 1970, the bank became a Scheduled Commercial Bank. Recently, it opened a representative office in Dubai.